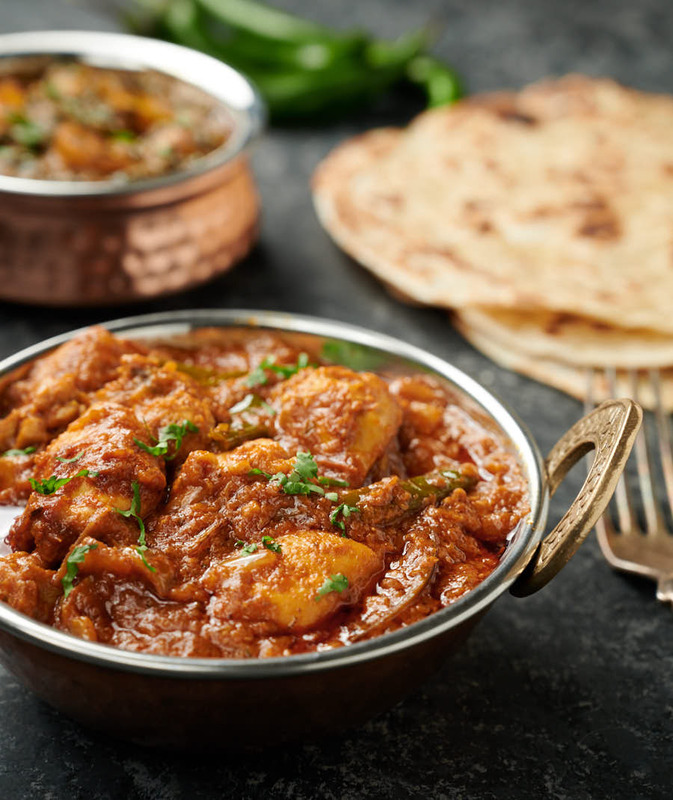 Dopiaza curry is an ancient Indian dish that’s become a favourite worldwide. And it’s not surprising. Big, bold tastes of spice and lots of onions make this one seriously tasty curry. 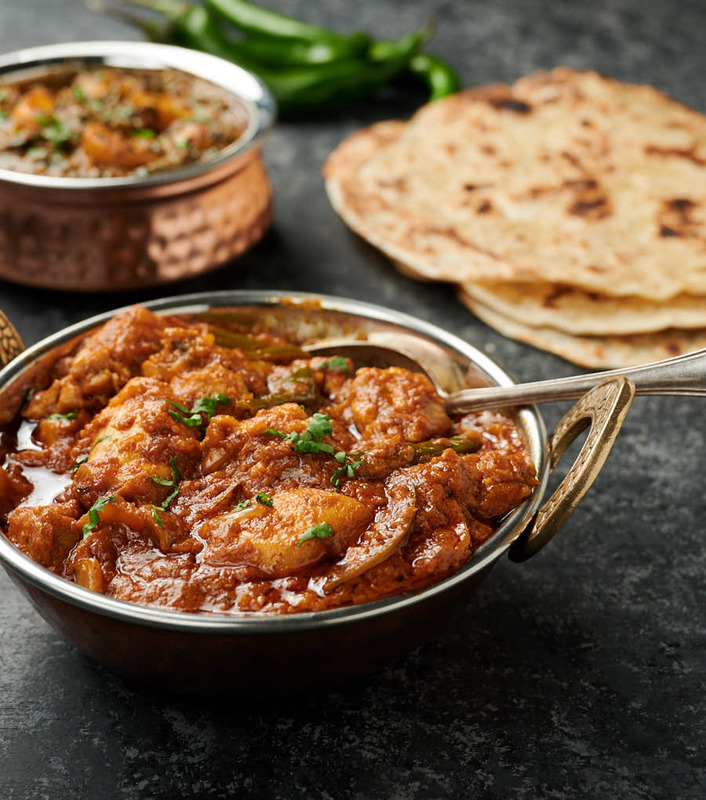 Dopiaza hails from the Hyderabad region of India so it’s a South Indian homestyle curry that’s been adapted to work in restaurants. 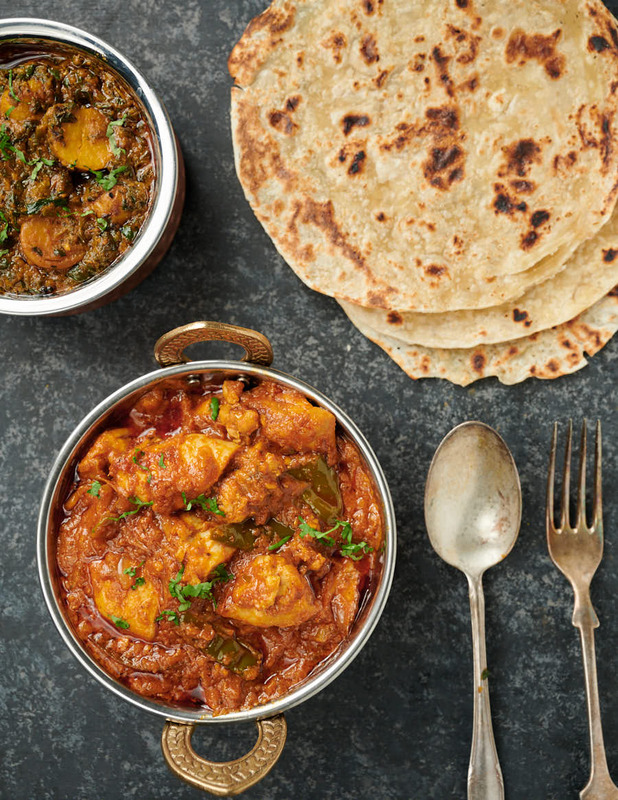 If you like onions, and you like curry, I think you’ll like a dopiaza curry. There’s a bit of a legend around the origins of dopiaza. It was invented by accident when the cook of a Moghul emperor accidentally added way too many onions to a dish. Good thing the emperor liked onions. This could have ended badly for that cook. The cook’s name was Do Piaza. His name lives on in this dish. Seems unlikely but who am I to question legend. It’s a good story anyway. And it’s a great curry. One that’s been refined over the years. I like green chilies in my dopiaza curry. Big hunks of green chili. Gives it a little bit of a jalfrezi thing. That’s not so conventional. So if you want to stick to the more conventional version leave them out. Up to you. Dopiaza means two onions in Persian. But it’s not really two onions. It’s onion two ways. Finely diced onion is added at the beginning and pre-fried large pieces of onion are added right at the end. Doesn’t seem like a big deal but it’s the little things that make dishes great. And there’s really onions three ways in this dish. Curry base is mostly onions as well. 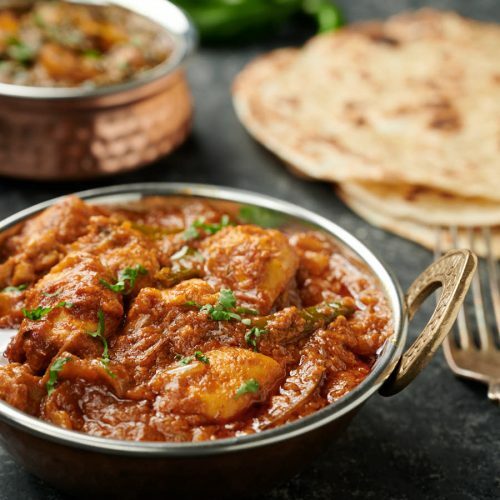 This is a master dopiaza curry recipe. You can make it with pre-cooked chicken, lamb, beef or use paneer, pre-cooked potatoes, mixed vegetables or fried eggplant for vegan options. Before you start do your prep. That’s important. Make your curry base and have some heated and ready to go. Pre-cook your meat. Measure out your ingredients. Have everything ready. Put on an apron – a bit of splatter is part of the fun. If you have not read the guide to Indian restaurant technique yet, do it now. It has pictures to help you understand the recipe. There’s a video there too. And a guide to Indian ingredients in that post. Crash course in Indian restaurant cooking. Dopiaza curry is popular for a reason. It’s just a simple, tasty curry. Not too fancy. Not too many ingredients. Just lets the onions shine through. Try it. Pretty sure you’ll like it. 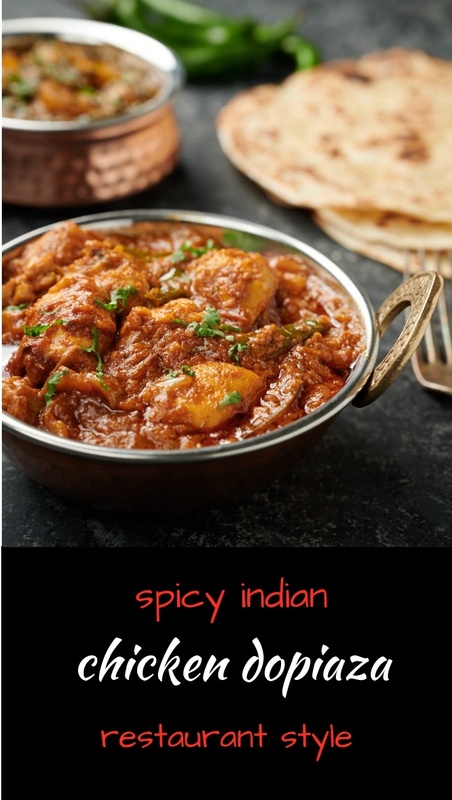 Indian restaurant dopiaza curry is a medium hot curry with a hint of sweetness. If you want to keep things milder, roll back on the kashmiri chili powder or leave out the green chili. You can make this with chicken, lamb or beef. For vegan alternatives, simply substitute tofu or pre-cooked potatoes. Pre-cook the coarsely chopped onion. Heat your skillet over medium heat. Add 1 Tbsp vegetable oil and fry the onions until the edges just start to turn brown. Remove onions but leave the oil in the pan. Heat your frying pan (don't use non-stick) briefly over medium heat. Add the rest of the oil. Use all the oil specified. It's important. When the oil starts to shimmer add the finely diced onion and and stir every few seconds until the onion is soft and starts to brown, about 3 minutes. If you are using the optional coarsely chopped green chili add it in after 2 minutes (so it cooks one minute). Stir in the green chili and minced cilantro stems and stir. Cook for another 15-20 seconds. Add the rest of the curry base and let cook until the bubbles form. Turn the heat down to low and add the pre-cooked lamb, beef or chicken, the pre-cooked onions and the sugar. Onions are my favorite and if dopiaza translates to “two onions,” I’m already a fan! Your curry recipes all sound amazing and I can’t wait to try this one, thank you for all the amazing tips, tricks and instructions. Pinning for later! Hope this one lives up to expectations. It is big on onions for sure. It’s really three onions because the curry base is mostly onions as well. :O I LOVE onions! The more the better I say! There’s something about browning onions that just smells and taste so fantastically umami! …and I’d probably have this with noodles! haha 🙂 I’m such a noodle girl. This dopiaza recipe is layer upon layer upon layer of onions so I think you’ll like it. Curry with noodles – don’t see why not. I’m going to try that too. Cooked this tonight. Followed your recipe to the letter. Superb. Really is the nearest thing I have had to a restaurant dish. Will now work my way through the rest of your Indian dishes. That’s great to hear. Hopefully I’ve covered a few of your favorites. If not, let me know and I’ll try to post them soon. What is the problem with non-stick cookware? I wonder. A big part of Indian cooking is the slow caramelization of the onions. That takes time. Nobody wants to wait for a curry in a restaurant. 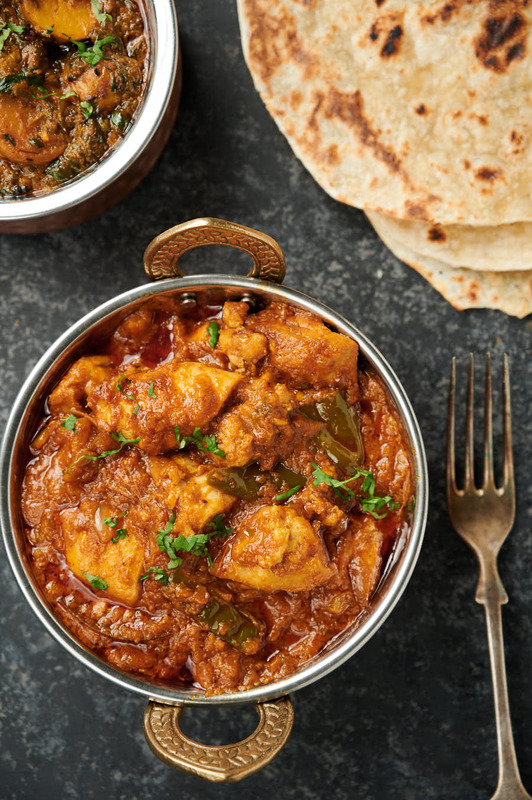 Restaurant style Indian cooking relies on high heat to get that effect. Non-stick inhibits this.